Do you know what’s influencing your kids’ beverage choices! 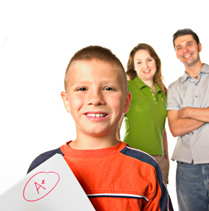 You may be surprised to find out of the techniques they are using to reach your kids. Sugary drink and energy drink brands are early adopters (a person who starts using a product or technology as soon as it become available) of new forms of marketing popular with youth. 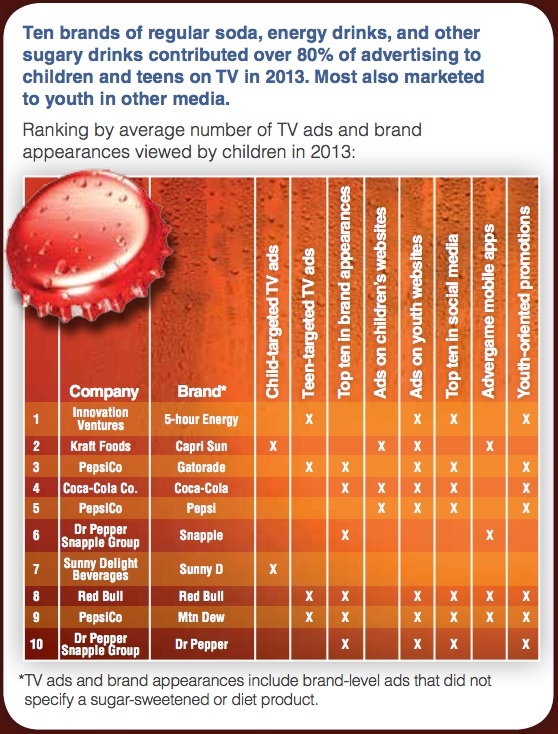 Prime-time TV programs with the most brand appearances viewed by youth in 2013 included America’s Got Talent (Snapple), American Idol (Coca-Cola), X Factor (Pepsi), and The Big Bang Theory (Sprite, 7UP, Monster Energy, and Red Bull). Teens viewed 12% more brand appearances on prime-time TV in 2013 than in 2010. Ten brands of regular soda, energy drinks, and other sugary drinks contributed over 80% of advertising to children and teens on TV in 2013. Most also marketed to youth in other media. Coca-Cola, Red Bull, and Pepsi were the top-three drink brands on Facebook, Twitter, and YouTube. Two other energy drinks – Monster Energy and Rockstar – ranked among the most active brands on social media. 5-hour Energy had the most-viewed You Tube video with 46 million views, while Red Bull’s channel featured 4,200 different videos. Pepsi’s social media followers increased by 600% on Facebook and 30-fold on Twitter from 2011 to 2014. Red Bull, Monster Energy, Rockstar, and Gatorade had over 200,000 Instagram followers; while Pepsi, Red Bull, Coca-Cola, and Mountain Dew had more than 25,000 followers on Vine. Child-friendly advergame apps include Fanta Fruit Slam, Fanta Fun Tap, Snapple Spiny Lobsters in Snaplantis, Mtn Dew Baja or Bust, Lipton Cool Cubes, and Sierra Mist Must Haves. The American Academy of Pediatrics recommends that children under age 18 never consume energy drinks, but these products are marketed directly to youth. Advertising spending for energy drinks increased by 9% from 2010 to 2013, totaling $175 million or 20% of advertising for unhealthy drinks. Energy drinks and shots represented one out of three TV ads for unhealthy drinks viewed by teens and one of four ads viewed by preschoolers and children. Teens viewed 30% more TV ads for Red Bull and 20% more 5-hour Energy ads than did adults, indicating advertising targeted to youth. PepsiCo launched new highly caffeinated Mtn Dew varieties (Kickstart and Game Fuel) and marketed them directly to teens on TV, the internet, and in social media. Sugary drinks and energy shots increased advertising spending on Spanish-language TV by 44% in 2013 versus 2010. Pepsi regular soda did not advertise on Spanish-language TV in 2010, but spent over $16 million in 2013. 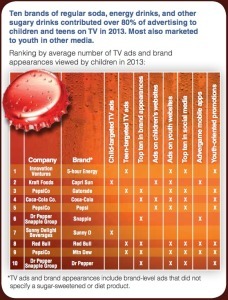 Pepsi ads represented approximately 20% of sugary drink ads viewed by Hispanic youth on Spanish-language TV. SK Energy, a new energy shot, and 7UP advertised on Spanish-language but not English-language TV in 2013. 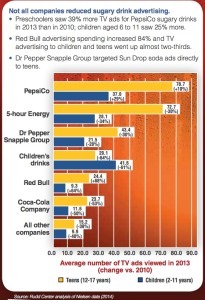 Dr Pepper Snapple Group spent $20 million (up from $7 million in 2010) to support 7UP and Dr Pepper regular sodas – almost 20% of unhealthy drink ads viewed by Hispanic youth. Sunny D increased Spanish-language advertising by 18% in 2013 versus 2010, representing one-third of its TV advertising budget. Black youth saw over twice as many TV ads for sugary drinks and energy drinks than did white youth. Black teens saw more than four times as many Sprite ads and more than three times as many ads for Coca-Cola. 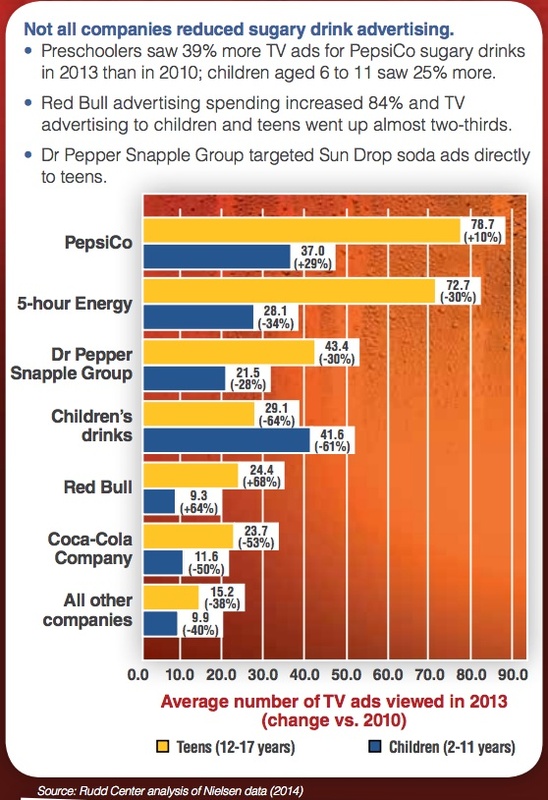 Other brands that advertised disproportionately more to black teens included Vitamin Water, Sun Drop, Snapple, 5-hour Energy, and Red Bull. Websites that attracted disproportionately high numbers of Hispanic youth included 5HourEnergy.com, 7UP.com, and Sprite.com. Websites that were relatively more popular with black youth included Welchs.com and Gatorade.com. 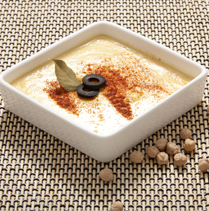 Companies appealed to multicultural youth through other forms of marketing. Coca-Cola, Dr Pepper, 7UP, and Pepsi sodas promoted numerous youth-oriented music and sports sponsorships to appeal to multicultural youth. Jarritos, a regular soda brand from Mexico, advertised on English-language TV in 2013, placed 34% of its internet ads on youth websites, and ranked in the top-20 Facebook brands. Latino-targeted content on YouTube included Lipton Brisk “Bodega chats” videos and Fanta cartoon videos in Spanish. 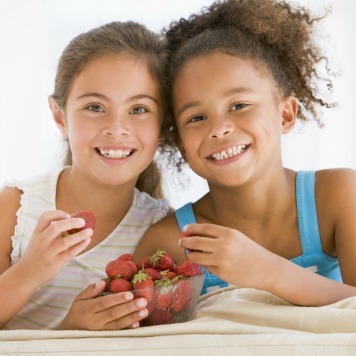 The Rudd Center is a non-profit research and public policy organization devoted to improving the world’s diet, preventing obesity, and reducing weight stigma. The Rudd Center serves as a leader in building broad-based consensus to change diet and activity patterns, while holding industry and government agencies responsible for safeguarding public health.